Educational Foundation - Non-Tax Deductible Funds - Beta Kappa Chapter - Sigma Nu Fraternity, Inc. The Sigma Nu Alumni Chapter and House Corporation would like to provide an update about our House and our potential future plans. Our current tenant, Pi Kappa Phi Fraternity, has been in the house for two years and has three more years remaining on their lease. The lease is triple net meaning, they pay rent that covers our mortgage payment, insurance, taxes and most day to day maintenance costs. The lease also provides the oversight of a professional property manager. We are responsible for expenses related to roof and structure that keep the property up to code and safe as a residence. 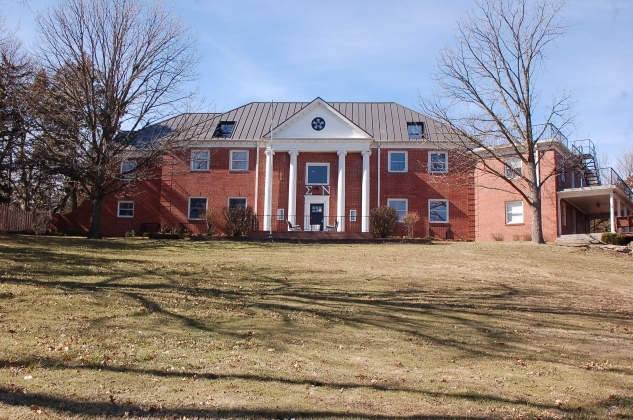 The Beta Kappa House Corporation inspected the House in May and it is holding up reasonably well as Pi Kappa Phi have been good stewards of the property to date. As most of us know from our own experiences with home ownership, properties need constant investment to protect their value. Our chapter house currently has several items that need attention from a safety standpoint and several more to protect its structural integrity over the next three years. In addition, we need to begin our recolonization feasibility study which includes some structural options for our house and other preparations for our relaunch. This study will also assess our alumni chapter support to undertake this task and provide the basis to reapply for our Charter from Sigma Nu to restart operations at Kansas State. We require approximately $250,000 to meet these obligations as Lessor to our tenant and lay our groundwork for our future Sigma Nu colony. Our chapter house was once leased by the U. S. Army during WWII for housing purposes and then by the university for women students for a short time. Through our history of good or bad times, our alumni built and maintained our house for the good of the chapter. They did it for us, now it’s our turn. You don’t have to look far for a successful recolonization. Down river, Nu chapter at KU recolonized a couple of years ago and has quickly accomplished the following: number one in scholarship for new initiates, 3.59 GPA and all house at 3.41. Leaders, they have them, two of nine IFC seats are Nu members along with the student body president. Fraternity membership continues to grow at K-State and the university is committing more resources to Greek life. The basic elements for future success are in place, as long as we have the financial and time commitment from our alumni. Please make a donation to assist in this effort.